Small scale farmers across Africa have farmed peanuts as a staple and cash crop for decades. Because of their good flavor African peanuts made up a significant part of world peanut trade until the 1970’s. However, because of growing concerns over aflatoxin (which is believed to cause cancer), African peanuts have lost access to the lucrative snack peanut export markets. Peanut oil is another important use for peanuts, and during processing much of the aflatoxin can be removed. It is a highly priced oil, particularly in China. However, with the exception of Senegal there is no real production of peanut oil in Africa is taking place, not for local and not for international market. On the local market peanuts are a staple used for sauces and snacks. However, most Africans have never heard of aflatoxin and unwittingly consume severely contaminated peanuts. There is no premium paid for aflatoxin free peanuts in the local market and thus no incentive for farmers to reduce aflatoxin levels. As a result, peanuts are currently a marginal crop in most of Africa, farmed on small areas of land by small-scale farmers, mostly women. They use and reuse seed from outdated varieties that become less productive each time, and few other inputs are used. The yields of the crop are in most cases very low: less than 1 ton per hectare or half of potential. The lack of markets due to low quality and low yields mean that the small revenues gained by the farmers don’t allow for any investment in improved farming practices. Without an attractive financial incentive, it is impossible to expect farmers to invest in improved seed, irrigation and fertilizer or change the way peanuts are dried, shelled and stored. The Bill and Melinda Gates Foundation and GiZ contracted Sense to look into what economically sustainable opportunities exist to revitalize the peanut industry in Africa. The key question was: Which market with which product and which processing technology can offer opportunities for income growth for farmers and processors? We mapped the various markets for peanuts (snack, peanut butter, oil) and identified interesting market opportunities. We identified typical business models supplying into these attractive markets, and analysed the processing technology used, the direct cost, investment costs overheads and revenue to see which business models are profitable and thus economically sustainable. Finally, we looked into the causes of aflatoxin and prevention methods at each stage of production and processing. The analyses clearly showed that a medium sized business with modern processing equipment focusing on the international snack market is the key to reviving the industry. This market is lucrative enough to pay for investments in aflatoxin management. Rejected peanuts can be exported to China for oil production, or processed locally in refined peanut oil for the local market by existing vegetable oil producers. Oil production is only profitable if the overcapacity can be used of a factory already producing sunflower, soy-bean or cotton seed oil. Exporting crude oil to China is not profitable, nor is it profitable to sell crude oil in the local market, because the met margins on refined oil are much higher then on crude oil. Peanuts in Africa are generally harvested, dried and shelled on farm. They’re then sold either to traders, processors or directly onto the village market. Traders or processors clean and sort the peanuts for further processing according to external appearance, size and shape. The best peanuts could be exported for the EU or US snack markets. Snack grade peanuts need the least processing and offer the best returns. To reduce aflatoxin contamination they need to arrive cleaned and well dried at the factory, where they are shelled and sorted on size by machines, before being blanched. Optical sorters are essential to remove contaminated peanuts. During the blanching (removal of the thin skin on the kernel) a lot of aflatoxin can be removed. 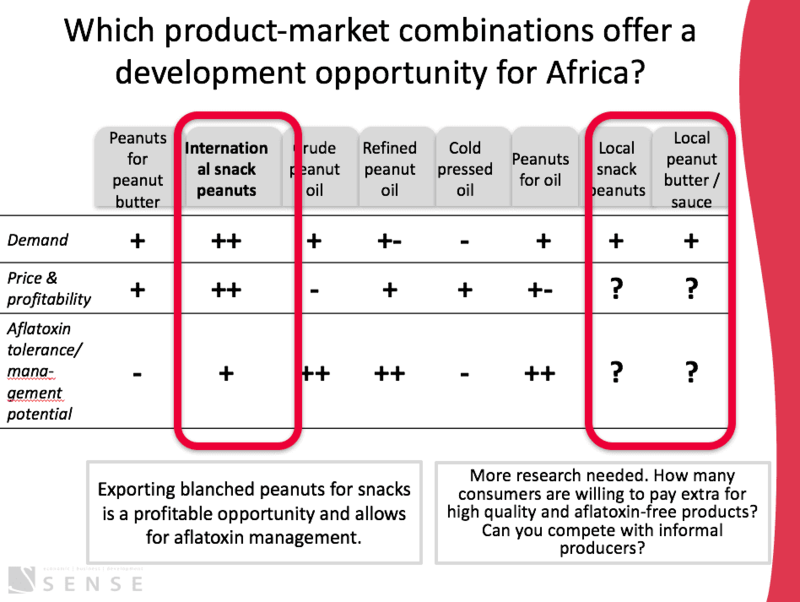 Unfortunately, too few African peanuts meet the aflatoxin standards for the international snacks market. This is partly because they are shelled by hand by farmers, and not properly sorted and blanched. This is why there is currently little export. Europe is the largest market for snack grade peanuts but African peanuts often exceed the aflatoxin limits of importing countries. The risk of costly rejections in port makes these markets inaccessible. Especially in light of competition from highly organized producing countries such as the US and Argentina. Eastern Europe and China are potential markets having less rigorous aflatoxin controls. The domestic and regional market is large and growing but doesn’t offer a price premium for aflatoxin free, because people have never heard of aflatoxin. Peanut butter and peanut paste manufacturers can use split and broken peanuts but require consistent size within one batch and low aflatoxin levels. Peanut butter is usually manufactured in the importing countries according to local requirements. So there is little opportunity for a peanut butter export industry in Africa. Because the peanuts are roasted in the skin, which is often partly added to the peanut butter, there is a very limited opportunity to reduce aflatoxin in the process. And because peanuts are shipped in the skin, contamination will increase during transport. This makes supplying the peanut butter market unviable for African producers. However, peanut paste is a popular sauce ingredient in many African countries and accounts for a large part of African domestic peanut consumption. Unfortunately, the unattractive kernels are normally used for this, and those tend to be the aflatoxin contaminated ones. 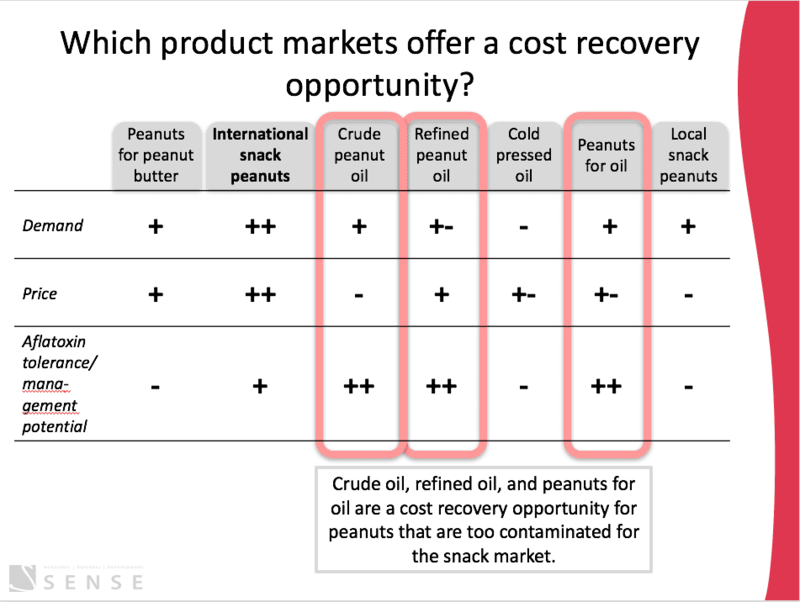 Peanut oil offers an important opportunity for cost recovery, but the profit margins on peanut oil are insufficient to make it viable to use good quality peanuts for oil. Normally rejects from the snack export (splits, broken, aflatoxin contaminated, malformed, small) are used for peanut oil. The oil making process can eliminate most aflatoxin. A large part remains in the press cake, while much of what is left in the oil can be filtered. During the refining process more aflatoxin can be removed. However, the press cake that is normally used for animal feed will remain contaminated and can cause liver disease in cows, as well as contaminate milk. Peanut oil is not widely used in Africa because it is relatively expensive compared to palm oil, cotton-seed oil and sunflower oil. The primary market for peanut oil is in China and South East Asia where it forms an integral part of traditional cuisine. These countries are major peanut producers themselves but their domestic market consumes as much as they produce. China, the world’s largest peanut producer is becoming a net importer, exporting their best peanuts to the European snack market and importing process grade peanuts for oil manufacturing or sale on the Chinese snack market. This offers potential export opportunities for African peanut oil or peanuts for oil production. Currently, export of oil grade peanuts to China is more lucrative than export of crude peanut oil. We strongly suspect that this is because Chinese oil producers resort the peanuts on arrival, and sell the good looking peanuts on the local snack market. This despite the fact that they are aflatoxin contaminated, and China has strict laws in place. Production of unrefined peanut oil for export is currently only profitable if the factory sells the best peanuts on the snack market. The process for oil extraction from peanuts doesn’t differ greatly from other oil seeds like palm, cottonseed or sunflower oil. This means that existing cooking oil factories could easily process peanuts for oil without much additional investment. Many of these factories currently operate below capacity and could expand their revenue stream to include peanut oil. However, the domestic African peanut oil market is likely to be a niche, because prices are double to three times the price of other vegetable oils. There is also no tradition of cooking with peanut oil in Africa as there is in Asia. As China becomes a net importer of peanuts and peanut oil it is possible that African peanut oil can be exported in increasing volumes to China and South East Asia where peanut oil is considered nutritionally and gastronomically superior to other oils. Peanut oil offers a potential cost recovery for high aflatoxin peanuts in Africa, but the margins on peanut oil production are not sufficiently high for it to become the backbone of the peanut industry. Aflatoxin remains the ghost that haunts the African peanut industry. Improvements in farming, handling and storing practices will have to be made if an export industry is to thrive. Meanwhile, the study has shown that an integrated approach to processing, involving snack peanuts, peanut paste, and peanut butter as primary income streams, and peanut oil and the press-cake as cost recoveries, a sustainable and profitable industry is possible. 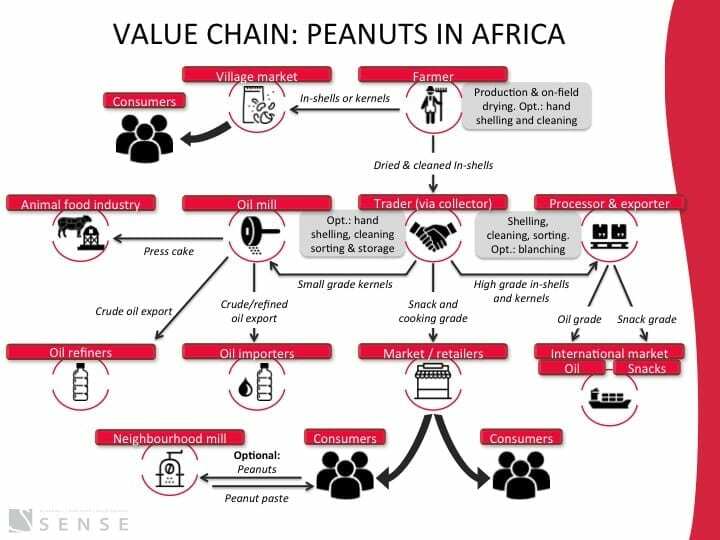 If market opportunities in Eastern Europe, South East Asia and China can be developed there may yet be a prosperous future for the peanut industry in Africa.